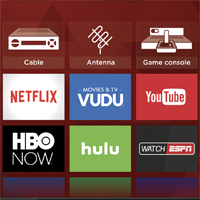 Smart TVs can also be used to track what you watch on your devices. The New York Times looked at one popular TV tracking service, Samba TV, which "essentially pays" brands like Sony, TCL, Sharp and Philips to include its software on their Smart TVs. "Once enabled, Samba TV can track nearly everything that appears on the TV on a second-by-second basis, essentially reading pixels to identify network shows and ads, as well as programs on Netflix and HBO and even video games played on the TV," reports The Times' Sapna Maheshwari. "Samba TV has even offered advertisers the ability to base their targeting on whether people watch conservative or liberal media outlets and which party’s presidential debate they watched. The big draw for advertisers — which have included Citi and JetBlue in the past, and now Expedia — is that Samba TV can also identify other devices in the home that share the TV’s internet connection." Samba TV, she points out, doesn't directly sell its data. "Instead," she adds, "advertisers can pay the company to direct ads to other gadgets in a home after their TV commercials play, or one from a rival airs. Advertisers can also add to their websites a tag from Samba TV that allows them to determine if people visit after watching one of their commercials."